At Judah Studios LLC we love to help local artists shine by displaying and selling their various works of art. Everything here is handmade or re-purposed. Our staff includes interior designer, Jen Haas, who uses her decorating talents to draw out the artists creations and enhance their abilities. Jen Haas, Jen is an interior/exterior color & design specialist, and also a seamstress. As store director, these gifts are clearly displayed within Judah Studios. Jen is also available by appointment for interior/exterior color & decorating home consults, staging & curb appeal consults, and custom sewing. Rosalind Kealiher, owner of Dekaios Designs in Stevens Point, her profession is Graphic Design and Photography, she uses that in her art as you can see in her photo prints and in her works with this website. Her pastime includes upcycling and creating as you can see with her slumped bottles, burlap flowers, and other miscellaneous treasures. Linda Raymer, owner of Brushed, her specialty is in chalk paint. Her talents are really well exhibited in her refinished, re-purposed furniture. The quality of these redone pieces is strong, it is all furniture that will last a lifetime and is repainted in a very modern feel and look.
. Jim McKnight I have been a resident of New Hope Township for nearly forty years, and most of my work is based on that long term connection with its landscape and people. Mostly self taught, I have worked in pen and pencil, pastels and watercolor for many years. Since stepping down as co-owner of Gimme Shelter Construction in Amherst, I have been able to focus more on studio time and to consistently push my skills. Every piece is a reminder of how much there is to learn, yet every piece opens new doors. I work mostly from on-site sketches and photographs, often finishing in the studio work that has begun in the field.I have always been fascinated that a painting or drawing can stop time and represent a unique perception in time for the artist, yet can also convey other information and emotions to viewers beyond the artist’s own conception. At its best, it can be an infinite expansion from a single idea, each viewer enlarging the sense of the piece, perhaps we could call it the Big Bang Theory of Art. 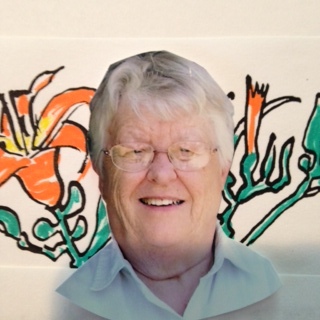 Dagny Arlene Heig Born in Winnipeg Manitoba Canada, I inherited my drawing talent from my Norwegian Mother and a love of language from my Irish Father. While pursuing a nursing degree, I studied art at the University of Minnesota. I am the perennial student! I love to draw! There is no “right” subject, whatever is around, I will draw. Drawing is a meditative process for me both calming and energizing. Ann Wright After thirty-five wonderful years of working in Colorado, my husband and I now call Amherst, Wisconsin, our home, and our new place of working. While we loved the wild west, the draw to come back to our homeland was great. We are presently surrounded by many friends, some whom we have known all of our lives, and by many artists of all sorts. We have been working at being artists since 1970 when we first opened our studio and Gallery in Elizabeth, Colorado. We have gone through many transitions including selling the gallery in 1982 and concentrating on selling my paintings through well-established, professional galleries and museums primarily in the southwest. In 1993 we moved to an adobe home and studios we built in Redstone Canyon to the west of Fort Collins, Colorado. Living and working on the 5000 acre ranch was a dream as the cattle drifted about, bears perused the wild plums, the mountain lions admired our chickens and the garden grew—-and the rattlesnakes admired our porch. In 2005 we sold the place in the Canyon and came here to continue our work in art. Both of us still sell in galleries and museums but we like to think we are more relaxed and less inclined to deal with the above wildlife of canyon living. Life here among the lakes and forests has been and is inspiring and most pleasurable—and that includes the fantastic micro-brewery right here in this charming village. Jaime Sherf- Raised in Amherst, I’m a local gal who absorbs myself in an array of artistic adventures. I specialize in using texture and color to give the old a little something new. On any given day, you’ll find me knee deep in paint, fabric, yarn or paper crafts and, quite possibly, all of the above. I love being able to help people share the uniqueness of a handmade gift. When I’m not creating things, I’m watching the Brewers, spending time with my adorable nieces or planning events for a local summer camp. 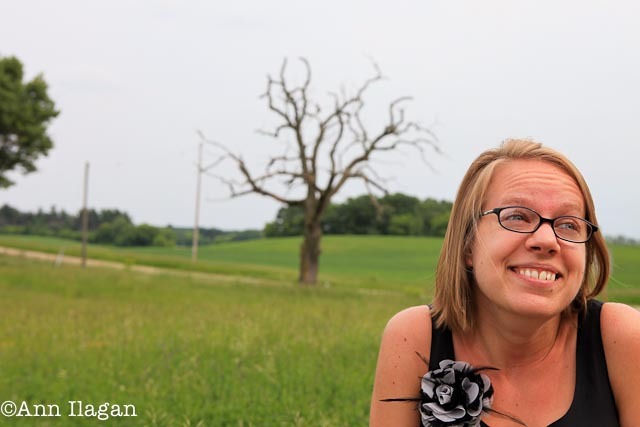 Ashley Megal “under the ashTree”- Hello and welcome, my name is Ashley Megal and I am a local artist residing in Amherst, WI with my darling husband, two furry kids, and various farmyard animals.My business is to create. I work mainly in colored pencil and ink. The drawings that you will find on my greeting cards and prints are not pre-thought or sketched. They are just creative energy from me to you. My work is printed on 100% cotton rag paper, packaged with 100% recycled envelopes, and sealed with a compostable sleeve and love. To view my work and read more about what I do, feel free to visit my website: www.ashleymegal.com.Thank you for supporting the Arts! Fancy Alpine Products LLC- is a Wisconsin company that is family owned and operated. Our incredible line of goat milk lotion is a result of Heathers creativity, desire to help others with sensitive skin, also Jasons love of animals and the dairy industry. 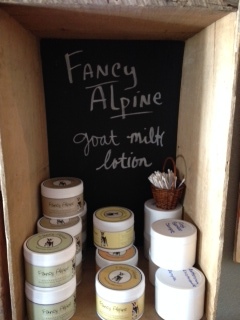 Fancy Alpine goat milk lotion is hand made, hand labeled, and has been a blessing to us and those who have the opportunity to try it.